The archaic levels of the human brain and psyche cannot understand the rational/modern/scientific truth of nature, reality, and our own psyches – because they are pre-rational structures – therefore, it is essential to retain pre-logical, pre-rational mythological stories about reality, nature, and cosmos so that the primordial, primal, and evolutionarily more primitive structures of our psyche, both subconscious and conscious, can communicate with our more sophisticated, rational, and scientific minds in a language that is mutually intelligible. If this were not so, there would be no need for science as a way of knowing to compensate for our deeply irrational, superstitious, and biased thinking that constitutes the vast preponderance of our thinking. Perception flows from interior to exterior regions of the brain, from evolutionarily oldest to newest. An unidentifiable perception flows first through the startle reaction of fear and flight, then the emotive, superstitious and paranormal explanation before finally, when enough data has been collected, to fit to our rational understanding of nature. Attention: This is not necessarily an article about Intelligent Design; this is an article about how we think, how we think about scientific propositions, how we think about our own and other people’s thinking and more particularly how the logical fallacy of the Argument from Ignorance can be part of the dynamic. All of what follows was wrapped around a conversation that was organized around a discussion of Intelligent Design hosted by the Watermark Community Church in Dallas on April 19, 2009 at a forum called The Creation Conversation. Ok, the building, the host, and the audience were some brand of evangelical Christian, and their ulterior motives were whatever they were, but that doesn’t mean there is nothing for the rest of us to learn from what transpired there, that is if you can be open minded enough to set aside for the moment the place and intentions of that particular conference and learn something from what was said there. Therefore, we will all be expected to proceed, for the sake of the discussion, as of the subject matter is worth of being treated as a legitimate hypothesis, to be falsified or passed forward to the next round of discussion because it attempts, in good faith, to answer a question that other hypotheses have failed so far to answer: How in the world could these complex machines and systems have come about without intelligence? 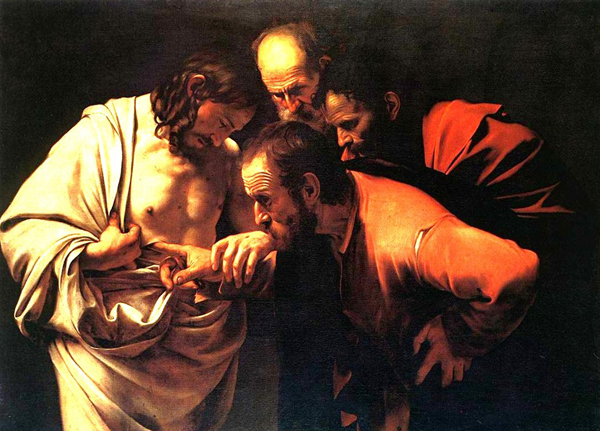 A reader left a comment on the image of The Incredulity of Saint-Thomas by Caravaggio from my March 10,2012 post: When the Uncertainty Monster Rears its Wicked Head Should We Tell the Truth?-A Comment on Curry. And you know me well enough by this point to know that if I’m going to take the time to write a 500 word reply I’m not going to simply leave it to languish forever buried under an illustration for a year old post. Once in a while I find that, intellectually, I have bitten off more than I can chew in one bite and have to spit it back out so I can cut it into a more manageable mouthful. Unfortunately what is left lying on the plate is usually not very appetizing, and you really don’t want to put it back in your mouth. I have had one of those two-half messes sitting in my WordPress drafts folder for the past several days as I’ve been working up the courage to pick them back up off the plate and start chewing again. Since I’ve already put in a fair amount of time on the subject I’m loath to let the mental effort go to waste – this may have something to do with my yankee waste-not-want not upbriging about not wasting food. So, I will be a good boy and attempt to clean my plate. Hopefully in the process I can produce something appetizing for your intellectual apatite. The waste basket is the writer’s best friend. No doubt true, especially in the days of the manual typewriter and yellow legal pads, the ability of the writer to look critically at his own work and stop wasting time on an unworthy effort can be invaluable; however, I’m also very hip to the archeological notion of mining the midden for useful information, so the office trash receptacle could really be more some kind of a recycling bin or cache for potentially useful bits of intellectual fodder. Wygart is having some kind of a dispute with a friend elsewhere in the digisphere that is revolving around the extreme difficulty there is in talking about the authenticity of knowledge gained from non-ordinary experiences. Hopefully, with the able assistance of our senior editor Upaya, some type of gainful resolution will be brought to the matter. I’ve decided to be helpful by illustrating how things actually work around here. Usually trouble starts with something Phi does or says, [as ironically happens to be the case between Wygart and his friend ] – it’s simply amazing the amount of trouble that fool character causes! Next the Meme Merchant team gets together to start to work on the problem. The method that is used around here is to use characters to represent mythologically various endogenous and archetypal psychological functions. These characters are then worked up in the form of some kind of art: a picture, a story, poetry, epigram & etc to attack the problem at the archetypal and mythological level. Once this is done it is easier to interpret down into the more mundane psychological levels without the human people’s hurt feelings getting in the way – or – being limited by discussing higher level psychological functions in a lower level mind-space. Chiefio, has another even more long winded post than the last, its also possibly more interesting and more significant. This one is about The Club of Rome and its paranoia and anxiety producing effects upon those who gape in horror at the the apparent avariciousness of its agenda. If after reading my previous post you were already beginning to put together the ‘A list’ for your own defenestration party, Chiefio provides you with quite an index. Any discussion of a somewhat shadowy NGO such as the Club of Rome naturally provokes quite a bit of anxiety turning around the subjects of who they are, what is their REAL agenda and WHERE DO THEY GET THEIR MONEY. Quite naturally this sort of thing can provoke a certain amount of paranoia, something I am always on guard against [in myself especially] if for no other reason that it tends to leave me disheartened, pissed off, or both. I was visiting The Pointman at his blog recently, when I picked up on an older post which I had previously passed over entitled, “William Johnson; echoes of an unimportant life”, not recognizing at the time the eponymous William Johnson as Blind Willie Johnson, the legendary Texas blues man, and one of the very rare human artists honored by having a recording of his music sent to the stars aboard the Voyager spacecraft in the 1970’s. Time to correct that. The Pointman in his own inimitable way gives a pithy précis of William Johnson’s life, some of the significance of his musical legacy, with an added discourse on the history of the Voyager program, and how Gary Flandro invented the orbital mechanics that made ‘The Grand Tour’ of the solar system of the Voyager program possible. I highly recommend this post, you won’t get much of what follows if you don’t, and The Pointman in general. What made this particular article stand out in my mind, and which opened a door to my particular [peculiar?] mind was this paragraph here. But there’s a piece on it by another musician of interest though. It’s called “Dark was the night, cold was the ground” and it’s by William Johnson. It’s a curious piece of music. I first heard it when I was in a bad situation and was hurting. There was something eerie about it. It was as if I was listening in stillness to someone else who was there with me, but we were both somehow listening together. It isn’t quite blues or gospel but something else altogether; Ry Cooder called it the basis of all slide guitar and “the most soulful, transcendent piece in all American music”, which is a lot of responsibility for any one song to bear. The technical merits of the song I’ll leave to Ry, because he’s a knowledgeable and gifted guitarist, but I do know that it is important in terms of its impact on me and others I’ve spoken to. It has been a long, long time since I have listened to ol’ Blind Willie, so I had to go have a relisten. You can have a listen here. Naturally I have some thoughts on the subject. Every once in a while Nature and the local children co-inspire to hand you an illustration for a concept that would otherwise be hard to illustrate. Cognitive dissonance is a discomfort caused by holding conflicting ideas simultaneously. The theory of cognitive dissonance proposes that people have a motivational drive to reduce dissonance. They do this by changing their attitudes, beliefs, and actions. Dissonance is also reduced by justifying, blaming, and denying. The phrase was coined by Leon Festinger in his 1956 book When Prophecy Fails, which chronicled the followers of a UFO cult as reality clashed with their fervent beliefs. It is one of the most influential and extensively studied theories in social psychology. A closely related term, cognitive disequilibrium, was coined by Jean Piaget to refer to the experience of a discrepancy between something new and something already known or believed.